BOGO. Buy one, get one of our hot chocolate sticks – just swirl this Belgian chocolate into hot milk, or do what Mrs. Mustard does — swirl in coffee for a rich mocha! 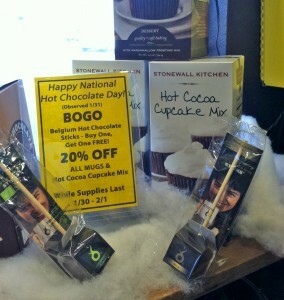 We have 20% off hot chocolate cupcake mix, too… while supplies last. Stop in at the Museum to Celebrate National Hot Chocolate Day (observed Jan. 31). We’re celebrating Friday and all weekend with these delicious specials… See you inside for some tasty hot chocolate!